2. Blank, without any logo on it, you can print yours or customer's personal logo on it. 3. Every Piece Tested and Formatted Before Delivery. USB2.0 1GB flash drives bulk, 100 pcs well packaged in individual foam slots. The packaging was so clean and neat, let you are confident giving these to your clients or friends. 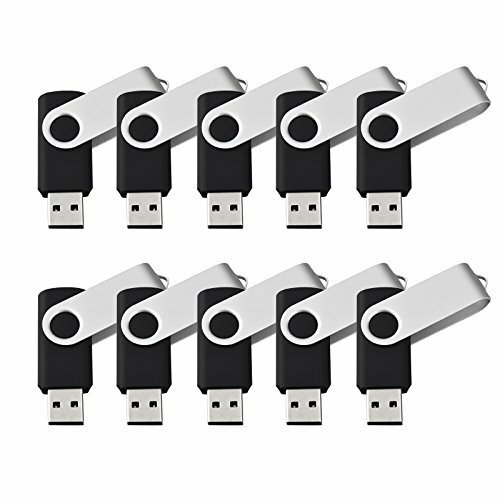 Swivel USB Flash Drive, tiny and classic style, the lightweight and portable usb sticks have a nice and sleek design with a metal swivel cover on each memory stick. The aluminum swivel is very smooth - making the flash drives look stylish and chic! They have a tiny LED inside which is solid red when connected and flashes when it's being written to. The end of the thumb drives has a loop for a lanyard or key ring to keep it safe or on your keys. Most affordable price, and every piece tested and formatted one by one before we shipped them out to make sure all product is no problem. HIGH COMPATIBILITY - Support windows 7 / 8 / 10 / Vista / XP / Unix / 2000 / ME / NT Linux and Mac OS; Compatible with USB2.0. Save Data in Form of Music, Photos, Movies, Designs, Manuals, Programs, Handouts; MP3, MP4, RMVB, EXCEL, WORD, PDF and so on. Fast Delivery, 100% after-sale service and risk-free satisfaction guarantee to enhance your confidence to buy the usb flash drives. Blank, without any logo on it, you can print yours or customer's personal logo on it.